In Part 1, I provided with walk through of how to install DHCP and configure scope on your newly installed DHCP server. 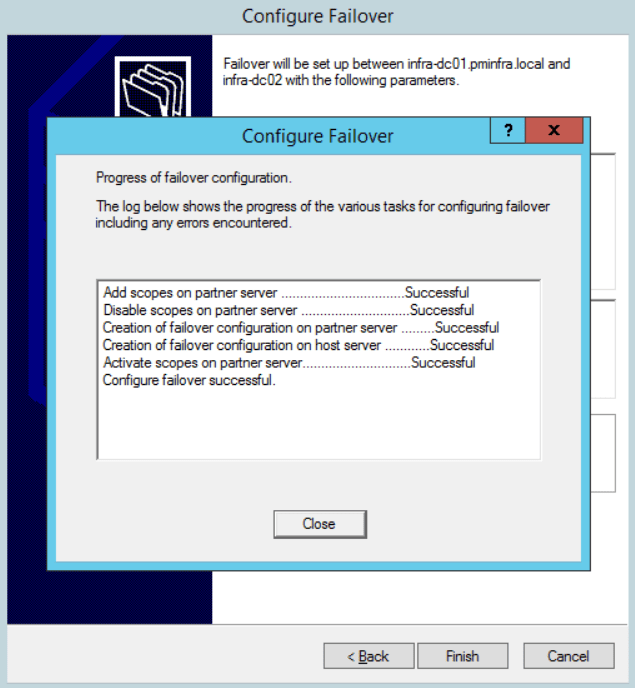 In this post, we are going to setup failover between two servers. I am assuming that two DHCP servers are installed and a scope is configure already. 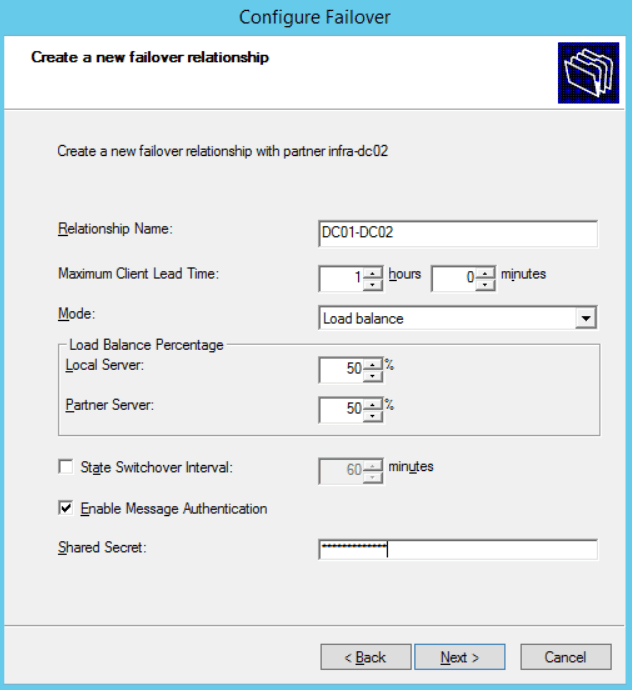 To secure communications between DHCP partner servers, you have an option to enable message authentication between servers. If enabled, you must specify shared secret. 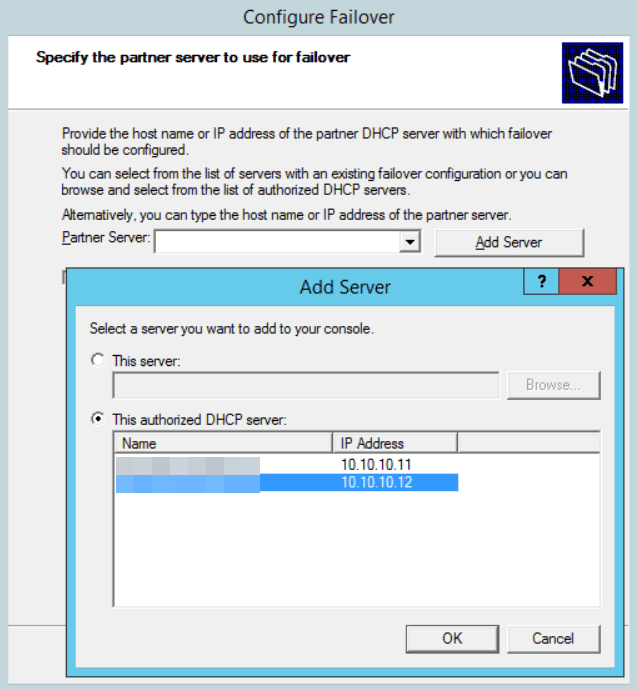 If all steps are successful, you now have a working DHCP failover pair, with no clustering required! Cheers! I was hoping you could explain them in laymen’s terms and also recommend a “Best Practice” approach. Max Client Lead Time (MCLT) is defined in RFC for DHCP failover document: http://tools.ietf.org/html/draft-ietf-dhc-failover-12#page-7. There are guidelines on setting MCLT values in the document as well: http://tools.ietf.org/html/draft-ietf-dhc-failover-12#page-43. And as it usually is in anything IT, the answer is always “it depends” on the factors that affect how different values affect network and DHCP partner. You will have to decide for your environment whether short MCLT will work or should you prefer long MCLT values. hi, thank you for posting this very helpful information. I just have one concern. Is there a way to setup virtual IP for these 2 servers. In my environment, we are using ip helper address pointing at our primary dhcp server. In case the primary goes down, the standby server must have the same IP address as the primary. Is there a way to do these? Hello and thanks for this great post. i would also like to raise some questions here! My scenario is a failover configuration in Hot-Standby Mode. 1) Are there any implications by configuring a low MCLT (e.g 1 min) + 1 min for the Auto Transition Timer in order to achieve faster failover ? 2)what happens if we configure the standby dhcp server for 0% percentage of the scope? Does this mean that in case it becomes the active server (following a partner down event) it will not be capable of assigning new leases? Or does it mean that whoever is the active server has the full “control” of the scope? Sorry I can’t really help with MCLT. Please read my response to Rob above. There are factors to consider and are unique to each deployment’s goals. Setting standby server scope to 0% is counterintuitive, don’t you think? What will it really achieve?! 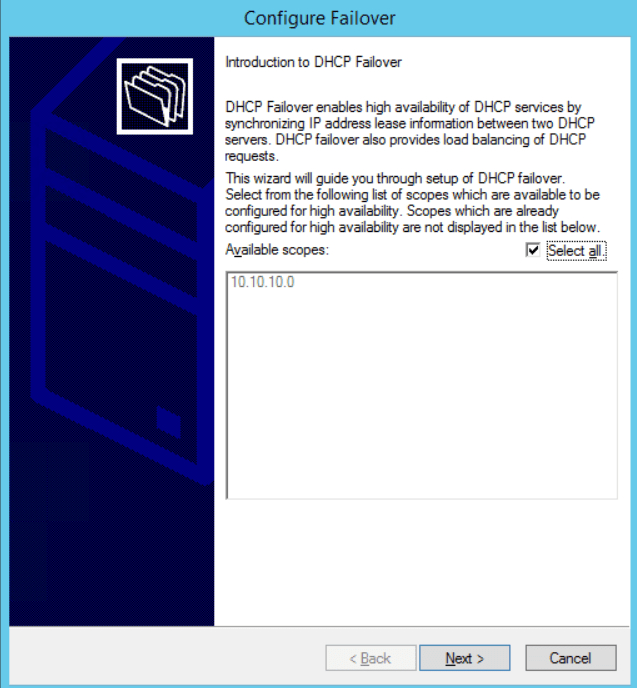 Does configuring DHCP failover have any implications on DNS? The obvious one, is when the IP address changes for the endpoint, the DNS registration will also change if the endpoint is configured to update DNS. IF an endpoint is receiving IP from DHCP, the shouldn’t be a reason to not allow dynamic DNS registration on that endpoint. Hope it helps. 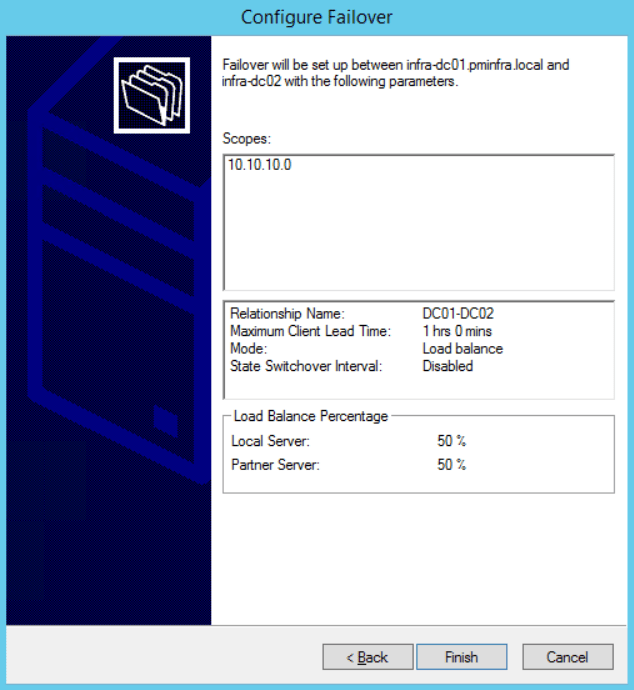 I choose Hot Standby instead of Load Balance for MS Patching reasoning. In other words patching a Windows server sometimes takes a fair amount of time and a reboot. 1) The lease is set to 3 days. So in this scenario the client should still maintain their lease while doing maintenance and will not switch over for 60 minutes. So the worse case scenario is if a new client requests DHCP or their lease expires is one hour. WHich in theory I could reduce but I think it is minor. Your approach is certainly logical and should work without any issues I can foresee.